The Buccaneers returned to early-season form with a 31-10 drubbing of the Falcons, as they used a threepronged attack by its offense, defense and special teams to secure the victory and improve its record in domes to 4-0. 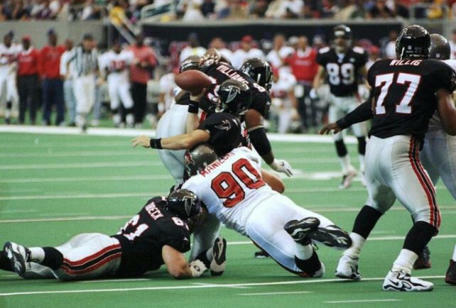 Trent Dilfer had a pair of touchdown passes and the WD-40 combination of Mike Alstott and Warrick Dunn saw another defense ran and passed over on the way to a Tampa Bay success. INDIVIDUAL STATISTICS RUSHING BUCS: Alstott 14-77, Dunn 14-76, Rhett 6-30, Dilfer 3-16, Walsh 1-0. FALCONS: Anderson 14-49, Hanspard 3-34, Chandler 4-11, Green 2-5, Christian 1-3. 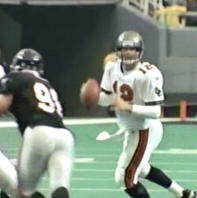 PASSING BUCS: Dilfer 20-12-150-0-2. FALCONS: Chandler 27-19-212-0-1. RECEIVING BUCS: Williams 4-38, Dunn 3-57, Moore 2-25, Copeland 2-23, Hape 1-7. FALCONS: Anderson 7-47, Green 4-54, Mathis 3-32, Emanuel 2-43, Kinchen 2-25, Christian 1-11. INTERCEPTIONS BUCS: none. FALCONS: none. KICK RETURNS BUCS: Anthony 3-55. FALCONS: Hanspard 3-53. PUNT RETURNS BUCS: Wiliams 0-0. FALCONS: Kinchen 4-25. 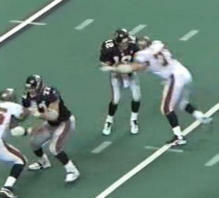 SACKS BUCS: Culpepper 3-28, Maniecki 1-6, Ahanotu 1-5. FALCONS: none.